As you went to college and began working in labs, your capacity to fix things really paid off, didn't it? I think if your play around with things and fix things -- and we used to sometimes work on automobiles or little radios or whatnot, anything -- that allows you to innovate. Innovate. You find that if you don't have exactly the right tools, you don't have exactly the right batteries or something, you can think, "Well now, how can I do this otherwise and fix it?" And that's necessary in the laboratory. When you're doing research, you're doing things probably nobody has ever done before, so you're inventing things, new ways of doing things and ways of doing things with what you have. Were there any mentors in your schooling that stand out, any teachers, whether in college or wherever, who affected you not only in terms of what they were teaching but as human beings? Well, most of my teachers were wonderful people, but I guess I was most impressed with the mathematics teachers. There were a couple of mathematics teachers I had that I liked very much. But I liked languages also, and I had some good language teachers. We had very high quality teachers and I appreciated them. In college there were very fine people teaching, they weren't doing very much research but they were excellent people, intelligent and considerate, and they encouraged us to learn and thought things through carefully and thoroughly. So they were good teachers. Your undergraduate work was at Furman College, and then you did your Ph.D. work at Cal Tech. Yes. My undergraduate work, actually it was Furman University it was called, but it did not really have graduate work at that time. Furman University was a small college, which was very good, because I could interact with all the professors and all the people. Then my final Ph.D. work was out at Cal Tech in California. And that was a very exciting time in physics, was it not? It certainly was. It certainly was. This was the 1930s. Quantum mechanics, nuclear physics, and so on, were growing. Nuclear physics had just been sort of discovered. We've had an exciting century in physics, I would say. Lots of different things have come up. But it was an exciting time in physics and also at Cal Tech. One of my professors was Oppenheimer, who became famous, and Millikan, and they had a lot of good people there. And it was an intimate relationship, because there weren't many students there. With your Ph.D. in hand, and you got your degree in '39, you really wanted to go to a university to teach but you chose not to. Tell us about that. Because I finished in 1939, jobs were very scarce, this was the Depression. Jobs were very scarce and I wanted to teach in the university and do research and find out new things. I didn't want to go into industry and just make things and help people manufacture things. But there weren't many jobs, and a Bell Laboratories person interviewed me and offered me a job. And my professor said, "Look, jobs are very scarce." I had thought maybe I would go as a post-doc and try for another year of looking for jobs. He said "Jobs are very scarce; Bell Laboratories is a good place," which it was. Bell Laboratories had a lot of good science. "You should take it." So all right, somewhat reluctantly I went to Bell Laboratories, which turned out to be a very good thing. I learned a lot from it. Wherever you go if there are things happening, you're going to learn. You worked on radar bombing systems. Tell us a little about that. Yes, well, I went to Bell Laboratories. They were to allow me to do basic physics. And I worked on how electrons come out of surfaces of material for a while. Then, all of a sudden, the big boss at Bell Labs called me in his office and said, "On Monday you are to start working on radar systems for navigation and bombing." Oh my dear! I had to become an engineer and a systems engineer to do this. Well, it wasn't what I wanted, but the war was coming on. Many people were getting into this, and during the war most scientists did work on military things to try to help us win the war. So I felt, well, okay, I guess I have to do that. So I did that, and again, it was a great success in the sense that I learned a lot. I learned a lot. You can learn from all kinds of situations, and I learned a lot of new things which many physicists didn't know. I learned about electronics. I learned about microwaves, and so on. And those have been the origins of much of my subsequent work. Whatever you do now is going to come out of what you learned in the past. And so it has. Photo caption, Lab: "Townes' laboratory and office at Caltech in 1938. 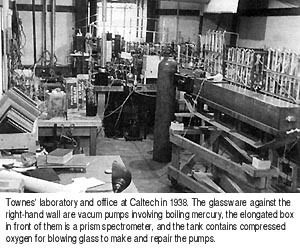 The glassware against the right-hand wall are vacum pumps involving boiling mercury, the elongated box in front of them is a prism spectrometer, and the tank contains compressed oxygen for blowing glass to make and repair the pumps."